August 18, 2018 (Alpine) -- Alpine has moved from emergency relief to recovery since the July 6 West Fire destroyed and damaged dozens of homes and other buildings. That’s the assessment of authorities still working to help about 55 families displaced after flames blazed through the eastern edges of the foothills community of about 16,000 people. Update 3:10 p.m.: 10 News, ECM's news partner, has provided a map of the #WestFire in Alpine. Update 2:30 p.m. Fire is now 350 acres in Alpine and 0% contained. Update 2:10 p.m. Lakeside Rodeo Grounds is open for large animal evacuations. Update 1:50 p.m. CHP has shut down I-8 east at Tavern Rd. The Tavern and Willows Rd. exits are also closed. 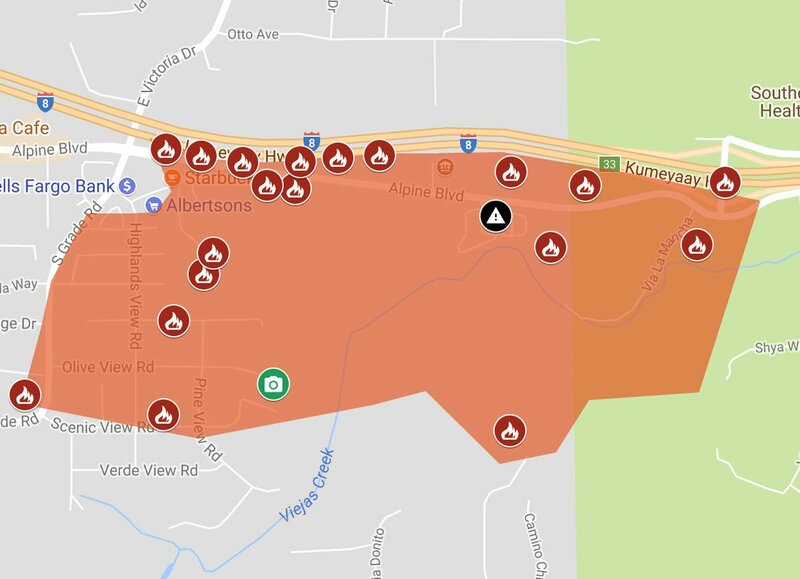 Over 1,400 homes are without power in the Alpine area due to lines damaged by the fire; estimated restoration time is 4 p.m. per SDG&E. Update 1:30 p.m.: The #WestFire in Alpine is now 150 acres. Mandatory evacuations are underway. Homes are burning on Honey Hill Road. July 6, 2018 (San Diego's East County) -- Two brush fires have burned at least one structure each in Dulzura and Apine. The #StructureFire at State Route 94 and Community Rd. in Dulzura has charred over 10 acres per Cal Fire and prompted 144 evacuation notices to be issued per County Emergency Services. NBC 7 has film of a structure in flames. In Alpine, the #WestFire started south of I-8, west of Willows, and is burning toawrd mobile homes, an eyewitness at the scene advises ECM. It is now estimated at 10-15 acres per Cleveland National Forest which confirms structures are threatened. A Fox TV video shows at least one structure already burning. A DC 10 has been requested. Robert Scheid, an eyewitness at the scene, says the fire in Alpine is burning toward mobile homes and that some flames are as tall as power poles.